A sophisticated writing instrument that makes for a thoughtful gift. Pierre Cardin have brought together class and sophistication to bring you these premium writing instruments. 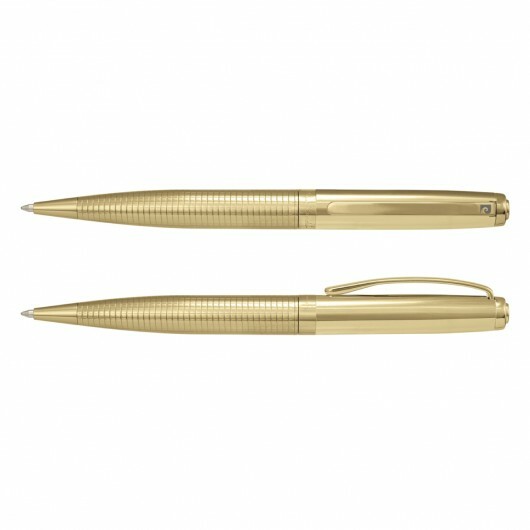 Made from brass the pens feature an electroplated finish and a large ink refill of 4000m Black Dokumental German ink. The lower barrel hosts a subtle guilloche engraved pattern and the upper barrel where your logo will be displayed laser engraves to a natural etch. They include the Pierre Cardin logo tastefully engraved on the centre ring and clip and come presented in a premium Pierre Cardin gift box. Laser Engraving: 30mm x 6mm.